House call. Step out into the beauty that is the month of May at West Fairmount Park, where the Shofuso Japanese House and Garden (left) is an oasis of calm in the city. Built in Japan in 1951 using traditional methods, the house once was displayed in the courtyard of New York City's Metropolitan Museum of Art and was moved to Philadelphia in 1958. Market watch. 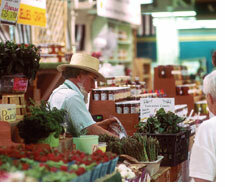 Established in 1892, the Reading Terminal Market at 12th and Market streets is well worth a visit -- and revisit. Among the delights: Pick up pickles, pretzels and fresh farm produce from the Pennsylvania Dutch vendors; buy a bite of artisanal, domestic or imported cheeses from Downtown Cheese; bring home a bottle from Blue Mountain Vineyard Cellars. Expense it. Even after 14 years, Vetri still receives raves from Philadelphia Inquirer food critic Craig LaBan. 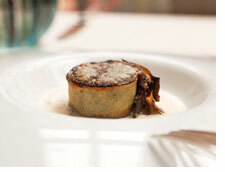 On the menu are rustic Italian delights for a prix fixe of $135. April's enticements included Nantucket Bay scallops, Louisiana white prawns and spinach gnocchi. Pictured is the venue's sweet onion crepe. Climb Here. Need a physical break from the conference? 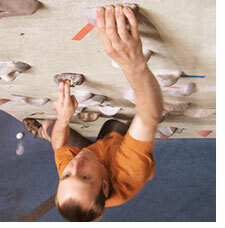 Head over to Go Vertical, a rock-climbing gym that offers day passes for $18 ($15 for off-peak hours). Bring your own gear or rent it. The two-hour Getting Started class costs $65. Be authentic: The seminal Philadelphia cheesesteak -- a crusty roll with thin-sliced rib eye and melted cheese -- was born around 1930. Go to bit.ly/HrFmeZ for a list of the 10 best places to buy one.